For Rick Eckstein, the Twins' Minor League hitting coordinator, May 15 was the day he knew. He was visiting Class A Cedar Rapids with the Kernels opening a series against Quad Cities. Part of the assignment was to check on the progress of 2016 first-rounder Alex Kirilloff, who was in his second month back from the Tommy John surgery that had cost him the entire 2017 season. It didn't take long for Eckstein to be pleased. In Kirilloff's first at-bat, the left-handed slugger stroked a 1-2 fastball the opposite way for a two-run homer, striking halfway up a light pole beyond the fence. Eckstein turned to Cedar Rapids hitting coach Brian Dinkelman. "I told him, 'There it is,'" Eckstein said. "'There's who he's going to be.'" Naturally, the moment for Kirilloff's father, Dave, came much earlier. It could've been the time he had Alex hitting off a tee at 11 months old. Or maybe it was when his son asked to take some hacks off a pitching machine at an Orioles Fan Fest event. He was three years old then. When Alex was 11, Dave -- a former Pirates scout who also worked as an assistant college coach and operates a hitting facility in the Pittsburgh area -- took his son to hit at a local field, just like they'd done countless times, but on this occasion, he wanted him to work on a leg kick, something he'd noticed becoming trendy in the Majors. "We were at the field for about an hour," Dave said. "He said, 'Pop, give me a couple more.' This field, it's about 300 feet. At 11, Alex is usually hitting around 275 feet. It's this big field for him. He keeps getting out closer to the fence. By the time we're done, he must have hit the ball 305 feet. It wasn't more pushups. It wasn't more situps. It wasn't stronger legs. He changed his hitting model. I still have the ball." For the younger Kirilloff, there have been countless personal breakthroughs. But after Tommy John surgery, he just needed his chance to prove it over a full healthy season. He did so in 2018, and now Kirilloff -- the No. 10 overall prospect in the game -- is the staff vote winner of the MiLBY Award for Breakout Prospect of the Year. The 20-year-old outfielder showed no rust, hitting .348/.392/.578 over 130 games between Cedar Rapids and Class A Advanced Fort Myers. His 71 total extra-base hits (including 20 homers and seven triples) and 296 total bases each led the Minor Leagues. He ranked sixth among full-season qualifiers in slugging percentage and 11th in the same group with a .970 OPS. Using wRC+ -- which takes into account league environmental factors -- Kirilloff was the Minors' fifth-best overall hitter with his 172 mark only trailing Vladimir Guerrero Jr. (194), Michael Reed (178), Nathaniel Lowe (178) and Jeff McNeil (176). "It was pretty successful as a whole," Kirilloff said. "The big thing for me was to get through healthy and injury-free, get back into the swing of things and shake some of the rust off. I really enjoyed that aspect of it, just getting back into it. But I was making some of the necessary adjustments along the way, and things ended up going really well." For all his history with the bat and his pedigree as the No. 15 overall pick in the 2016 Draft, returning strong from surgery was never a given. Kirilloff first felt something wrong in his elbow in an Aug. 28, 2016 game with Rookie-level Elizabethton when a throw from right field felt off. He was removed in the sixth inning and didn't play again the remaining week of the season. Hoping to avoid a major operation, he underwent platelet-rich plasma (PRP) injections in the offseason, but Kirilloff's elbow never got back to full strength and by early March, he was diagnosed with a torn ulnar collateral ligament in his left elbow. On March 8, he underwent Tommy John surgery in New York, ending his 2017 season. "The toughest thing is being away from the game," he said. "I'd never had any type of significant injury, definitely not one that caused me to miss this much time. Mentally, not being able to go out and compete is an awful feeling. So I challenged myself to get through rehab and do that as best I could. ... If all I could do was get stronger, I was going to maximize that opportunity." Though Tommy John is typically associated with pitchers, Kirilloff, who had experience on the mound from his high school days, had to go through a similar rehab process. He completed his own throwing routine by November and began taking live batting practice in February. Throughout Kirilloff's rehabilitation, the Minnesota organization was impressed by his work ethic. "From my perspective, around 20 years of being around this game, the way he went about his day-to-day during recovery was as professional and mature and focused as I've ever seen." Kirilloff may not have been able to work on his left arm or his swing, but he could work on his core, his legs and other parts of his body to develop pop. While he'd always been considered a potential plus overall hitter, his power was judged as merely average. "It was total body strength," said the Twins' No. 2 prospect. "I wanted to get all-around stronger. When they make you come in and work out every day, you don't really have much choice. You're going to get stronger. Everything happens for a reason, and maybe that was what I needed." It took time before Kirilloff's work bore fruit on the field. He was assigned to Cedar Rapids -- a small victory 13 months after going under the knife -- but produced a .254/.289/.451 line through 17 games in April. He and his hitting coordinator chalked it up to rust and rough Midwest League weather. But his father noticed something else. Dave Kirilloff harps on what he calls "timed hitting perception" and thought his son's tempo was off. If he picked up his tempo in the box while going through his pre-swing motions, everything could lock into place. "That tempo affected that, where the ball was going next," Dave Kirilloff said. "You ask Alex about mechanics, and he'll tell you he doesn't think about that so much as he thinks about timing. When he was going through this, there might be a slide here and there, so I might call him and tell him you need to stop watching the pitcher. There comes a point where you have to time your vision, and when he went from slow-medium to medium-fast in his tempo, everything lined up." By May 14, he'd pushed his season average to .303. It didn't dip below .300 again the rest of the way, including his time in Fort Myers. The following day Kirilloff connected on the oppo taco that convinced Eckstein he was on the cusp of an incredible -- and incredibly consistent -- year. From May on, Kirilloff established himself as one of the best overall hitters in the Minors. His .254 average in April was left in the dust; in his next worst-hitting full month, he still hit nearly 100 points better. Even a June 21 promotion to the Florida State League didn't slow down the ascendant prospect. Kirilloff went 4-for-6 with a homer and five RBIs in his second game with the Miracle. Kirilloff also demonstrated the ability to use all fields. At Cedar Rapids, he pulled the ball 37.5 percent of the time and sent it the other way 36.5 percent with the remaining 26 percent going up the middle. The split wasn't quite as eye-popping at Fort Myers (42.7 percent pull, 33.3 opposite, 24.0 center), but it's still significant. The spray chart showing his 71 extra-base hits is a thing of beauty to any baseball analyst. "That's something I take pride in," Kirilloff said of his distribution. "I've been taught that by my dad since a pretty young age, so it's something I've done through my whole life at this point. It's not something that even feels different to me about that being my approach. In BP, tee work, everything I do, I'm always working on making sure I can hit it everywhere." "It goes back to timing," Dave Kirilloff said. "Every year, about 30 -- only 30 -- will hit .300. These are elite hitters, the best in the world. What are they doing differently than all the other hitters? When you look at the .300 hitters, they're taking the ball all over the field. Derek Jeter was a dead-pull hitter coming up, but if you look at his career, he hit a lot up the middle, a lot the other way. He took inside pitches to right-center field. Even Vladimir Guerrero, he was doing the same. "Why? Sometimes, you practice doing that early on. We'd warm up with working on outside pitches, then work on inside pitches. On the inside pitches, I told him not to pull them. Work on putting them back up the center of the field, but keep everything calibrated. When you're seeing it so well and timing it so well, you don't even think about taking an inside pitch up the middle. It just happens." "Everybody recognized pretty quickly he was going to be the best hitter wherever he went," recalled Eckstein. "Even in the FSL, they noticed he could handle the outside corner well, so they started pounding him in. One night I was there, they kept doing that to him, so he made the right adjustment and hit the ball over the right-field wall. He's always putting himself in a solid position to hit, no matter where they're going to come after him, and they'll keep doing that the higher he goes." Not only was Kirilloff posting remarkable numbers, but his arrival, along with that of 2017 top pick Royce Lewis on July 14, helped push the Fort Myers club to another level. Before the right fielder arrived, the Miracle sported a 28-40 record. The Class A Advanced club went 40-29 the rest of the way to snag the FSL South Division second-half title. Fort Myers then won five of its six postseason games to claim the league title as Kirilloff went a team-best 11-for-27 (.407) in the playoffs. "He's a great teammate, a real high-energy guy," Kirilloff said of Lewis. "He gets on base a lot, and when he's already sitting on second or third when I step in, that helps me a lot. We feed off each other and have become really good friends. We talk about our approaches and what we're seeing from each other. Regardless of our statuses, he's just a good guy to have around." 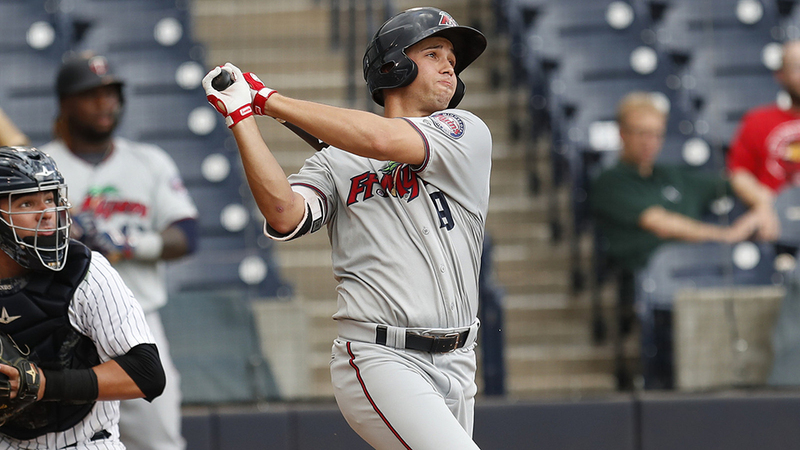 In Lewis and Kirilloff, Minnesota may have the Minors' most dynamic duo. Part of Kirilloff's success came from combining his father's lessons with the strength he added in 2017 and the Twins' hitting philosophy, which focuses more on hard contact (i.e., exit velocity) than it does on lift or launch angle alone. "Going off his track record, you wouldn't think the home run power would have come in quite this way, but he just has such an uncanny ability to leverage the ball," Eckstein said. "Once I saw it, I knew. 'OK, there it is.' It'll be fun to see where he goes." "For me this year the big thing was just being able to show up," Kirilloff said. "I wanted to be consistent, and I wanted to contribute to the team. However that shows up on paper and how people view that, that's up for others to decide. I know when I do well based on how well I contribute day to day, and I think it was a good season for that." To be a viable first-base prospect in this day and age -- especially a right-handed one -- a player has to absolutely rake. Mets slugger Peter Alonso more than fits the bill, earning him the fans' vote for Breakout Prospect of the Year. Perhaps no single moment summed up Alonso's season better than his mammoth homer at the Futures Game in July. In three years of Statcast™ tracking, there had never been a Major League homer hit harder than 110 mph with a launch angle higher than 45 degrees. Alonso's 415-foot shot shot was 113.6 mph off the bat at a 46-degree angle, and left Team USA manager Torii Hunter making comparisons to Mark McGwire. Ranked seventh in his own system a year ago, the University of Florida product delivered a Minor League-leading 36 homers and 119 RBIs in 132 games split between Double-A Binghamton and Triple-A Las Vegas. Alonso's 68 extra-base hits were third-most in the Minors, and he ended his season -- and the 51s' tenure at Las Vegas' Cashman Field -- with a no-doubt walk-off blast. The 2016 second-round pick was both the Mets' Minor League Player of the Year and their Defensive Player of the Month for July. About the only thing Alonso didn't do well on his way to being ranked as the Minors' No. 58 overall prospect was steal bases -- he was caught in all three of his 2018 attempts. Despite his fine campaign, the Mets opted to send Alonso to the Arizona Fall League rather than give him a September big-league callup. In his first 13 games with Scottsdale, he's batting .320/.397/.640 with a league-leading four home runs. Look for him to bring his power bat to Queens early next season.